This exercise is to write a article of 250 words in response to two comments made 52 years apart with contrasting views on the genre of photographic documentary. When comparing the two comments, and within the context of the original articles, I tend to reject Andre Bazin’s concept of a clinical documentary. In contrast Allan Sekula’s views seem more modern, literally. In 1945 when Bazin made this comment the world of photography was quite different and the views of photography, especially documentary were more of a science and modern technology. Bazin alludes to the photograph as an accurate record that cannot be argued with. I cannot fully accept this, even in documentary. Yes, an image is an accurate record of what happened but it is the photographer that creates it, it is not “formed automatically” as quoted. 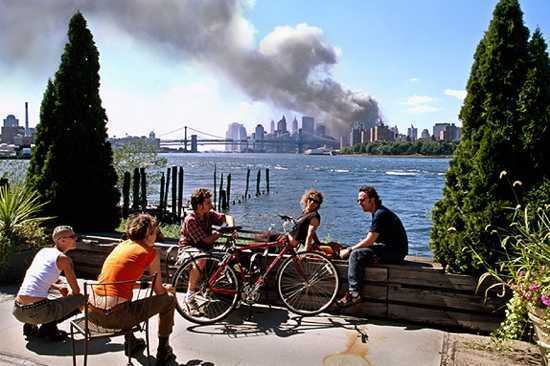 Thomas Hoepker, a German born photographer took this image of 911 but for fear of criticism did not publish it for five years. When published it still came under widespread criticism, when the subjects responded they replied that they were “in a profound state of shock and disbelief”. Clearly first impressions are otherwise. Even early documentary of the Western States of the USA, such as Timothy H. O'Sullivan, faithfully recorded what they were requested to, but neglected the cost to the Native American. There is so much more than just one still to record a moment – that moment that is recorded is defined by the photographer – the interpretation that they alone form. Allan Sekula interprets photographic objectivity as accepting that information (the image) is the “outcome of a culturally determined relationship”. This I interpret as the relationship between the photographic image and the creator. This I feel much more comfortable with and believe that this also underpins all photography, including documentary, as an art form.